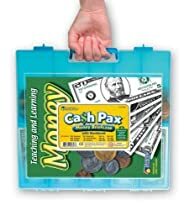 Learning Resources Cash Pax Money Briefcase for ages 5 – 9 contains a 64-page activity book that includes exercises, problems, games to help students practice bill, coin recognition, reinforce basic math operations. Handy money briefcase is spill-proof while it helps keep your school money sorted and organized. Briefcase contain dividers that can sort the 950 assorted coins along with bills. It helps to keep 100 each of pennies, nickels, dimes, quarters, 25 each of half-dollars, sacajawea dollar coins, 100 each of dollar bills, fives, tens, twenties, 50 each of fifties, hundreds.